Clean the clams and cook them adding 1/4 tsp turmeric powder, salt and little water. Keep it aside. Heat oil in a pan, add crushed shallots, curry leaves and salt and saute for 2-3 minutes. Add chilli powder, coriander powder and 1/4 tsp turmeric powder and saute for 1 minute. 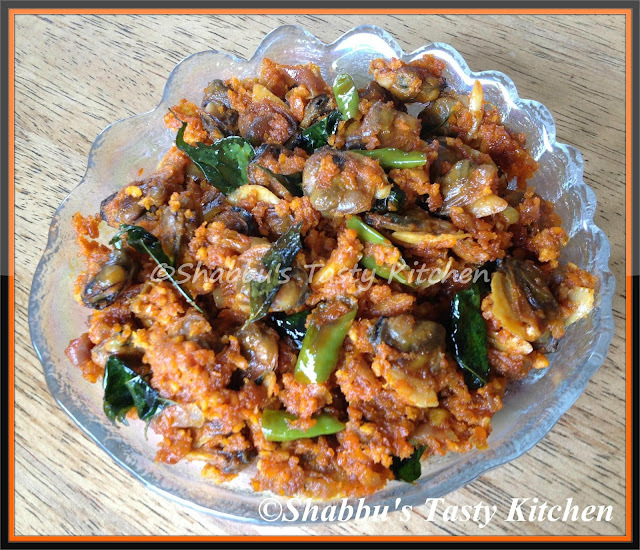 Then add cooked clams and stir well until all the masalas coated well with the clams. never tried clams before.. must be very delicious.. Awesome is the word for this..Craves for some. Never tried clams like this, my hubby will definitely love this.